FILE PHOTO: North Korean leader Kim Jong Un reacts during a celebration for nuclear scientists and engineers who contributed to a hydrogen bomb test, in this undated photo released by North Korea's Korean Central News Agency (KCNA) in Pyongyang on September 10, 2017. 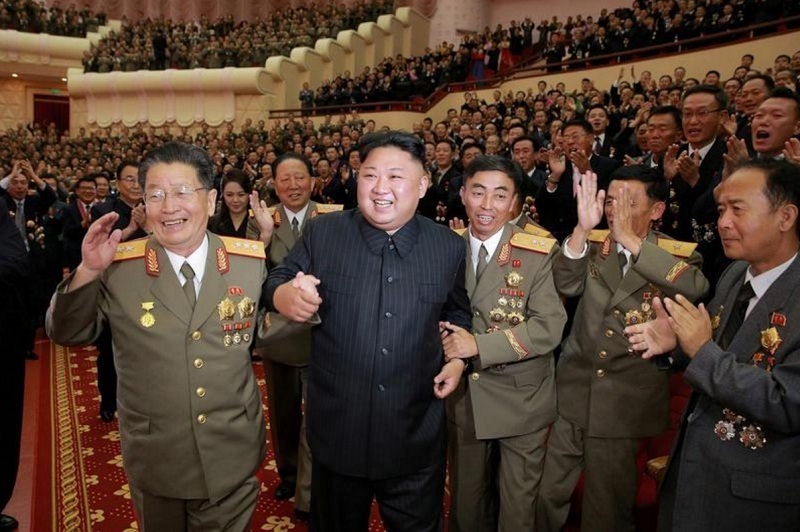 SEOUL/JAPAN - A North Korean state agency threatened on Thursday to use nuclear weapons to “sink” Japan and reduce the United States to “ashes and darkness” for supporting a U.N. Security Council resolution and sanctions over its latest nuclear test. Pyongyang’s Korea Asia-Pacific Peace Committee, which handles the North’s external ties and propaganda, also called for the breakup of the Security Council, which it called “a tool of evil” made up of “money-bribed” countries that move at the order of the United States. Juche is the North’s ruling ideology that mixes Marxism and an extreme form of go-it-alone nationalism preached by state founder Kim Il Sung, the grandfather of the current leader, Kim Jong Un. Regional tensions have risen markedly since the reclusive North conducted its sixth, and by far its most powerful, nuclear test on Sept. 3. The 15-member Security Council voted unanimously on a U.S.-drafted resolution and a new round of sanctions on Monday in response, banning North Korea’s textile exports that are the second largest only to coal and mineral, and capping fuel supplies. The North reacted to the latest action by the Security Council, which had the backing of veto-holding China and Russia, by reiterating threats to destroy the United States, Japan and South Korea. “Let’s reduce the U.S. mainland into ashes and darkness. Let’s vent our spite with mobilization of all retaliation means which have been prepared till now,” the statement said. Japan’s Nikkei stock index and dollar/yen currency pared gains, although traders said that was more because of several Chinese economic indicators that were released on Thursday rather than a reaction to the North’s latest statement. South Korea’s won also edged down around the same time over domestic financial concerns. The North’s latest threats also singled out Japan for “dancing to the tune” of the United States, saying it should never be pardoned for not offering a sincere apology for its “never-to-be-condoned crimes against our people”, an apparent reference to Japan’s wartime aggression. It also referred to South Korea as “traitors and dogs” of the United States. Japan criticized the North’s statement harshly. “This announcement is extremely provocative and egregious. It is something that markedly heightens regional tension and is absolutely unacceptable,” Japanese Chief Cabinet Secretary Yoshihide Suga told a regular news conference on Thursday. North Korea had already categorically rejected the Security Council resolution imposing sanctions over its latest test, vowing to press ahead with its nuclear and missile programs in defiance of international pressure. A tougher initial U.S. draft of Monday’s resolution was weakened to win the support of China and Russia. Significantly, it stopped short of imposing a full embargo on oil exports to North Korea, most of which come from China. The latest sanctions also make it illegal for foreign firms to form commercial joint ventures with North Korean entities. U.S. President Donald Trump has vowed that North Korea will never be allowed to threaten the United States with a nuclear-tipped missile, but has also asked China to do more to rein in its isolated neighbor. China in turn favors an international response to the problem. A North Korean state agency threatened on Thursday to use nuclear weapons to “sink” Japan and reduce the United States to “ashes and darkness” for supporting a U.N. Security Council resolution and sanctions over its latest nuclear test.